Nick "The Zone" Falzone (John Cusack) is an air traffic controller at New York TRACON, where it's busy 24 hours a day. He's acknowledged as the best, until a quiet guy Russell Bell arrives on the scene from the Southwest somewhere. Russell (Billy Bob Thornton) and his wife Mary don't quite fit into the close-knit community of controllers and their wives, and a rivalry soon builds. otsoNY Comments: The opening credit scene shows jumbo jets flying over Manhattan, a flight-path since 911 that no longer exits. This is in fact the only scene filmed in New York. 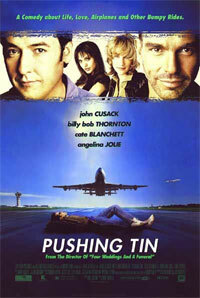 The rest of the film was shot in Toronto, Canada.